IHG (InterContinental Hotels Group) has opened Hotel Indigo Dundee, in one of Europe's rising design destinations - Dundee, Scotland. Once famous for its textiles, the city's industrial spaces are now filled with artists and collectives, including a thriving gaming community who have helped turn Dundee into the creative heart of the world's computer games industry. 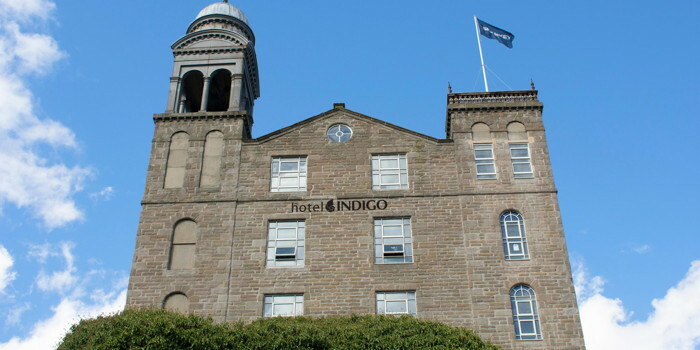 IHG (InterContinental Hotels Group) has opened Hotel Indigo Dundee, in one of Europe&apos;s rising design destinations - Dundee, Scotland. Once famous for its textiles, the city&apos;s industrial spaces are now filled with artists and collectives, including a thriving gaming community who have helped turn Dundee into the creative heart of the world&apos;s computer games industry. Dundee is the UK&apos;s first UNESCO City of Design and will be home to the soon to open V&A Dundee – Scotland&apos;s first design museum, making it an even more desirable city break destination for the arts and culture-inclined. It also boasts a generous offering of theatres, museums, galleries and shopping destinations, with world famous golf courses on its doorstep, including St Andrews. The city&apos;s cultural quarter features the award-winning Dundee Contemporary Arts centre, the Dundee Rep Theatre and the Sensation Science Centre as well as an array of restaurants and cafes. Transformed from a two-hundred-year-old jute mill, the 102-room Hotel Indigo Dundee sits between the waterfront and the heart of the shopping district. Rich in history, the first spinning mill was built on the site in 1822 by the Baxter family who became one of the world&apos;s largest linen manufacturers. Respectfully renovated, the hotel&apos;s three room designs are inspired by Dundee&apos;s past and present and feature the original vaulted brickwork ceilings. The Dundee Cake room brings in discreet marmalade motifs throughout the room with jute curtains. The Comic room is inspired by DC Thompson, the famous publishing house that had a famous comic called &apos;Black Bob&apos; about a sheepdog that saved the day, with sheepdog commands hidden in the dado rails. The Gaming room is reflective of Dundee&apos;s thriving computer game industry, the birth place of Grand Theft Auto. Secret gaming codes can be spotted within the dado rail, and literature found within the room celebrates Dundee&apos;s unique links to the video game industry. Beds are finished with blankets by a local textile designer, Hilary Grant, whose work is inspired by waves breaking on the River Tay. Hotel Indigo Dundee&apos;s restaurant and bar, Daisy Tasker, offers guests a contemporary spin on traditional Scottish dishes with an abundance of fresh seafood, prime cuts of meat and locally-grown fresh vegetables. It is named in honour of a much-loved weaver who organised activities for the jute mill workers and, true to the original Daisy&apos;s sociable spirit, the restaurant is set to be the ideal spot for family and friends to eat and drink together. William Inglis, General Manager, Hotel Indigo Dundee commented: "We are extremely excited to be opening our doors to guests. This is a unique and beautiful hotel and through clever design, we&apos;ve really brought its heritage to the forefront. Dundee has recently been voted as one of the best cities to visit in 2018 and its rich culture is showcased throughout the city. With the opening of the V&A later this year, we look forward to welcoming guests from the globe and have no doubt that they will fall in love with Hotel Indigo and everything this incredible city has to offer." Are you with Hotel Indigo? If you are a member of Hotel Indigo you may be interested in learning how to optimize your content on our network.